You’ve probably heard the terms “credit history” before, in relation to financial management and loans. If you struggle with its meaning and significance, we’ve laid it out for you. When you take a loan, it is recorded against your name and details for financial reference purposes. A credit history is simply a record of all loans and the borrower’s responsibility towards repayments. This can be gotten from financial institutions such as banks, lending companies, credit card companies and so on. 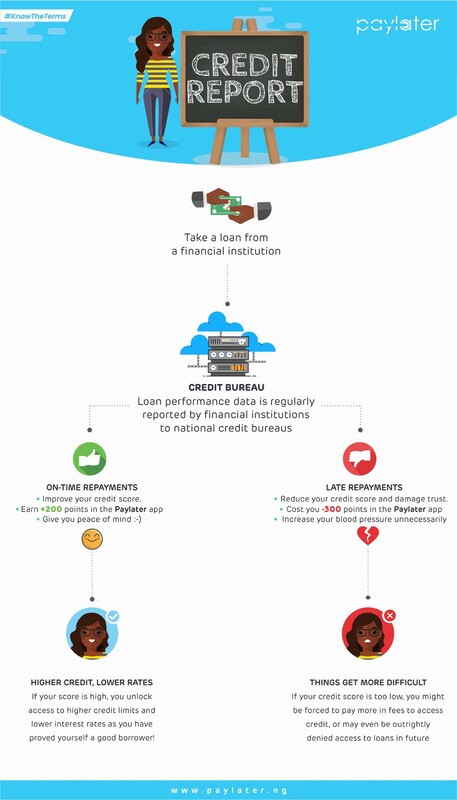 Using a borrower’s credit history, a credit report is generated. If a borrower’s credit history and report show prompt repayments and consistency, they stand a better chance to have a good credit score. A credit score is a number that expresses a borrower’s creditworthiness following an analysis of their credit history. In essence, prompt loan repayments build a good credit history and, in turn, a good credit score. At Paylater, we care about your financial health and credit history, so we came up with these helpful tips to help you build one. Realize there is such a thing as ‘too much credit’. Taking on multiple loans at a time increase the risk of missing a payment and then getting stuck in nasty cycles of debt — constantly taking additional loans to pay off previous loans which you’re already struggling to service. A loan is a serious obligation and should be treated as such — it probably shouldn’t be used to impress your boys at the club! Assess your needs prior to applying — is the cash need important enough to take out a short-term loan? Only take loans when you are certain you will have the means to repay on or before the agreed due date(s). Be sure to confirm all interest/fees associated with the loan prior to applying. Only proceed when you are comfortable that you will be able to service the expected repayments. Late repayments or defaults on loans are not only a breach of the contractual agreement between a borrower and a lender; they also come with very real consequences that can be hard to shake off in the long-term. Services such as Paylater reward you for on-time repayments with points, which can be used towards obtaining more attractive loan terms. If you don’t know what this is — you’re not alone! A lot of our new users start off unaware of the meaning of credit reports or the existence of the credit bureaus that store information on them. Financial institutions are required to provide these bureaus with data on the accounts you hold with them — this applies to current accounts, overdrafts, loans, and soon, even payments such as PHCN bills will be reported! Three of the registered bureaus in Nigeria are XDS Credit Bureau, CR Services Credit Bureau, and CRC Credit Bureau. You can order a self-report from any of the following organizations to review your credit history. Let us help you get better at managing credit — get in touch with us today or download the Paylater app on the Google Play Store.